No Visitor Comments have been posted yet. Click here to post your own. Known to locals as Toronto Lake, this state park is located in the gently rolling terrain of the Verdigris River Valley just southeast of the City of Toronto. Once this area was a favorite camping and hunting ground for the Native American Indians of the Osage Nation. The Army Corps of Engineers completed the 2,800 acre Toronto Reservoir in 1960. Since then it was become a favorite place to many for recreational activities such as fishing, camping, boating, hiking, picnicking, swimming and mountain biking. The 4,600 acre Toronto Wildlife Area is adjacent to the park. Surrounded by open prairie, hills of oak and savannah and forest, this flood plain provides visitors with a chance to see wildlife in its natural setting. Some of the most diverse flora and fauna in Kansas can also be seen here. If you are one of the many bird watchers in Kansas you will be in heaven. Stop by the Park Office or the Woodson County Chamber of Commerce to pick up a checklist of the names and seasonal distribution information of the 194 birds that can be found in this area. But if you're looking for a great place to fish then look no farther. Anglers are offered an excellent chance at white crappie, white bass, channel and flathead catfish, black bass, bluegill and sunfish. The park has complete facilities including group camp areas, pull-through and back-in utility sites and improved designated campsites for those not needing utilities. The electric campsites are open year round for those wanting to enjoy the park during the off-season. 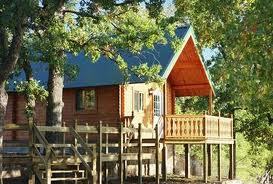 The campgrounds are served by modern bathroom and shower facilities. There are also cabins available that can be reserved up to one year in advance. Call or email the park today to reserve your group camp area, utility site or cabin!